This is simply one very good book by a good guy. Those who long for justice, spirituality, relationship, and beauty will find Tom Wright's exploration of these realities within the Christian story a compelling read. I connected with his often repeated refrain that we do not live in a world where God and everything are one (pantheism or panentheism) or in a world where God and everything else exist on the opposite sides of some great cosmic divide. Wright presents a reality of God and everything else overlapping and interlocking. Heaven (and God) are not me and you and the wind and trees nor is heaven (and God) polar opposites of earth and human existence. God and heaven are here in and around us. Torah and Temple, Jesus and the church are where heaven and earth, God and humans have overlapped and interlocked. We are called "to live at the intersection of heaven and earth." And Tom points out--it's not an easy place to live. His descriptions of the 'church' and her mission are profound, yet simple to grasp. The implications of his re-definitions of church and mission from what most of us have received are staggering. New creation began in earnest at the (bodily) resurrection of Jesus and because followers of Jesus participate in that resurrection, we are new creatures commissioned to announce to the world that with Jesus--his life, death and resurrection--everything has changed! Jesus alone is the world's rightful Lord. From this eminent and prolific New Testament scholar, historian and theologian, we get a down-to-earth vision of heaven (pun intended) and a breathtaking vision of Jesus of Nazareth, Israel's Messiah and the world's Lord. We are able to set the universal longings for justice, spirituality, relationship, and beauty into a thoroughly Trinitarian-framed, Christ-centered, world-affirming theology. We are invited to imagine how our little acts of kindness and love done out of loyalty to Jesus are changing this planet for the better. The "little seeds" will in fact become very big trees someday. Jesus said so. 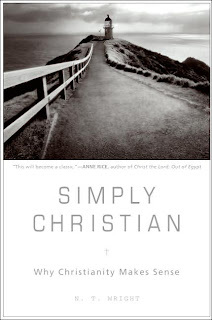 Simply go and buy and read Simply Christian: Why Christianity Makes Sense. N.T. Wright is my favourite writer/theologian. He has taught me so much about the kingdom of God, I'm incredibly thankful to God for him. This book is absolute quality, in fact I'm using it at the moment to do some basic discipleship with a guy who has joined our community and is beginning to follow Jesus. N.T. Wright's understanding and explanation of Christianity displayed in this book is a powerful orthodox view that will form a fantastic basis for radical discipleship and missional practise. I couldn't agree with you more. I enjoy the way NT Wright "packages" things we've assumed we knew---especially about Jesus. If I ever get "down under" I would love to get together with you. Blessings on you, my brother! I haven't read the book, but I did go see him speak about the book at Calvin. It seems to me that this is a much needed book. But I think that anything NT Wright writes is a much needed book (at least if it is under 300 pages). From his lecture, however, I had a few reservations. I don't think that he did justice to the distinction between pantheism and panentheism. I find Sally McFague's discussion of panentheism (a look at the God/World distinction through the use of the metaphor for the world as God's body and the discussion that though this rock, or this chair, or this person are not God, they have God in and through them) to be very interesting and it would be difficult to conflate with pantheism. Also, isn't panentheism something that we are working toward? How is making God all in all different than panentheism? Those are just some thoughts, that he probably deals with in the book, but it isn't 600 pages so he doesn't deal with everything (like he does in his trilogy). You're right that he does not take the discussion of some of his ideas as far as some would like. He admits that his space is limited and it's not the purpose of the book. I've not read Sally McFague's work, but it sounds intriguing. Blessings back at you! C.S. Lewis saved me from the bring of angry agnosticism, and N.T. Wright turned me down a brighter and - to me - more believable Christian path. I have a CD of downloaded lectures from the NT Wright page that I listen to most days during my commute, and I'm going to be reading every thing he's written that I can get my hands on. As a recovering fundamentalist, how does it feel to find the world and the faith to be so much bigger and freer? I liked your blogspots--are you writing a book on "The Wooden Door"? Thanks for stopping by and commenting. Yeah, I've read a lot of Tom Wright myself. John-I've been reading some of your comments on Jesus Creed blog and just wanted to say I appreciate your insights. I'm just a regular Joe up here in northern Wisconsin-no theological training. But I enjoy the conversation. Love to read NT Wright even when he's over my head. My former fundamentalism was my own doing. I wasn't raised that way, and it was a series of decisions that got me to where I was. Part of it may be my analytical nature. Honestly, I'm constantly afraid of slipping back into it. I'm only at the very beginning. It's like I'm standing at the break of day, the first light of the sun just coming over the horizon. It's still too dark to see much of where I am, but the breeze is cool and the air full of promise. The book I'm posting on The Wooden Door is one I wrote while doing mission work in Brazil. It was to be the first of three. I was three chapters into book two when we moved to the States, and I lost those chapters. I'm concerned I won't be able to finish the next two books. So much has changed. Thanks for this glimpse into your life. I celebrate with you the sense that a new day is dawning and soon there will be enough light for you to see so much more of God, his kingdom and the adventure of living in and as the "body of Christ" in the world. God bless you. If I could offer my philosophical $.02, in panentheism God is interdependent with creation. In pantheism, God is the creation; the universe itself is divine. Thanks for your comments at the Jesus Creed. Provocative, needed statements that shake up us(me) Evangelicals. 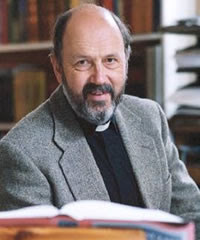 NT wright has a web page of articles and sermons. His books over 300 pages don't make sense for me. This Simply Christian and his NNP stuff is more doable. Just finished your book, good for non pastors like me also. What initially drew me to the book was that E Peterson wrote the intro. Thanks for your ministry. Hey, it's good to hear that Tom Wright is one of your favorites. When is your book on the atonement due out? John, I recently finished this book. What a rich read. And written for the church. My favorite kind of reading. It's a book worthy of reading and rereading. One of those books that can help many, including all of us. Well John, just let me know when you're on your way, I'll keep the spare room ready. Oh and John, can you turn on the RSS feed for comments feature? It's a new feature, but very handy for when you make comments and want to follow up on what is said after you. Thanks for preparing a room and keeping a light in the window :) I would love to come to Australia. Some day. I'm afraid I don't even know what RSS is. I will ask a more competent person to help me "fire it up." I have just heard about this book, and am looking forward to reading it, really enjoyed reading your blogs. Thanks for virtually crossing "the pond" and visiting. I returned the favor. I like Nora Jones, too. I appreciate your affirmation of the thoughts here at JTRP. Your will enjoy Simply Christian. This sounds like a wonderful novel! Markan Priority: The Power of "Being With Jesus"